Built with the specific purpose of powering the Venom Pro Touch HD Multi-Chemistry Charger, the Pro Power 1350W Power Supply delivers clean, consistent power for todays most demanding chargers. Built with a durable steel chassis that contains a total of four temperature controlled cooling fans, this power supply is capable of DC power output up to 1350W/60A and has a universal power input capable of handling both 110V and 220V (110V cable supplied). Power is transferred through dual gold-plated XT90 connectors and also features a convenient front panel USB port. Power output is user adjustable (12V-24V) by turning the easy grip knob on the front of the power supply. Connection information is presented on the backlit LCD display as well as the LED power percentage indicator on the front of the device. Rounding out this power supply are three safety features giving you protection from short circuit, over current and over temperature assuring your power needs are met with trouble free confidence. Looking for a cutting edge charger to pair with this power supply? 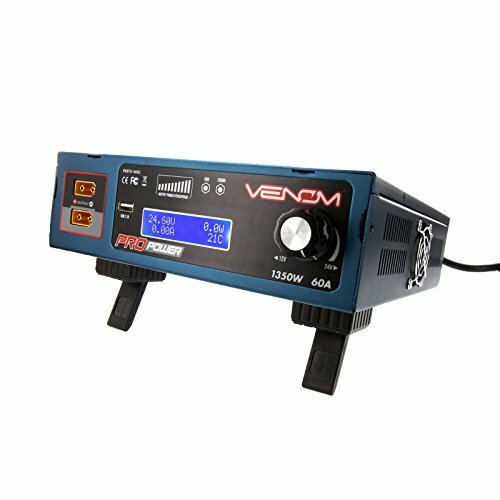 The Venom 1350W Pro Touch Charger was designed specifically to get the most from this power supply.